Media relations PR professionals concerned by growing trend for media to snub press embargoes. No to embargoes: WSJ in policy shift? The time-honoured tradition of the press embargo is believed to be under threat following reports that The Wall Street Journal (WSJ) is the latest media outlet to snub the tactic. The WSJ is reported to have introduced a new policy for its editorial staff, stipulating that they will not accept embargoes for stories unless they are exclusives. The claims follow an announcement by influential tech blog TechCrunch in December that it would break every embargo it encountered. The embargo policy at the WSJ is believed to have originated from a need to break stories earlier because of increased competition from other media outlets online. But PR practitioners have expressed concern that embargo-breaking would jeopardise the good relationships and trust they have built up with journalists. A PR professional should never assume that 'embargoed until ...' protects information from being published. The WSJ is gambling this will increase its importance as a carrier of breaking news. The risk is that PROs hold back the releases until the last minute and the quality of articles suffers. 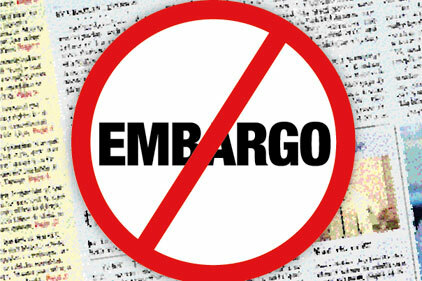 An embargo is based on trust. There's an unwritten rule that you don't break it. But it is a request, not a stipulation. With the increasing volume of social networking sites, embargoes may need a bit of clarification that they also cover these outlets.